One Stop Shop for All Your Captain's Needs! Welcome to the Captain's Corner, your first stop for all things related to being an Underdog Captain! 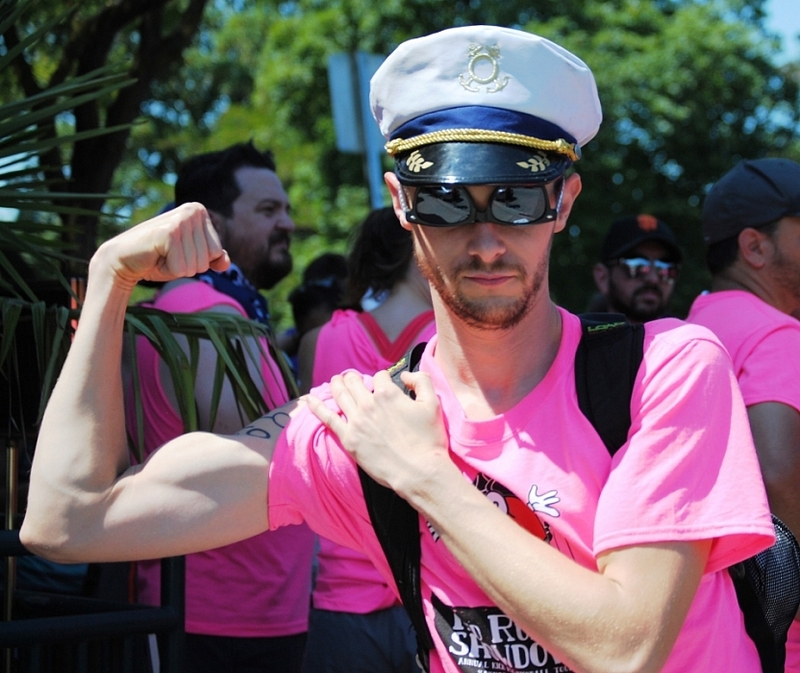 Whether a new or returning Captain, this page is designed to be a resource for Captains answering your questions, clarifying any rules, and providing you the tools you need to empower yourself as a Captain. What sports can I pick from? We offer eight different sports that vary in availability throughout the year, found on our Sign-Up Calendar. How much does each league cost? League costs vary from sport to sport and estimated prices can be found on our Sports Facts Page. When do I need to sign up by? Leagues fill on a first come, first serve basis so the sooner you sign up the better chances of getting a spot! There is no deadline, and we'll even offer Week 2 starts when available! Don't let choosing a unique team name or finalizing your roster postpone your registration... you can edit both after you've Confirmed your team spot in the league. How many players do I need for a Team? Roster Cap and required gender ratios informationcan be found on our Build Your Roster! Page. Roster sizes vary from sport to sport, and Underdog suggests that teams have at least one sub of eachgender. An extra couple members means more players, more fun, and more security if something unexpected comes up. Build a full team roster for all players to be eligible for playoffs and to eliminate the chance of any forfeits due to too few players. If your team needs to exceed the Roster Cap for your sport, you can purchase additional roster slots for $15 per person above the cap. You can assign these additional players TeamPayer fees once added. Check out more information how to add additional roster slots. How do I build my roster? As the Captain, you can build your roster during and/or after registration (whether your team has a Confirmed spot in the league or your team is Not Offered), however make sure you have your potential teammates’ names and emails, or "Connect" your account to Facebook and invite your Facebook Friends! From your Captain’s Panel, you can assign dues via Team Payer to each player that, once paid, will reduce the Team Balance. To see the Invitation Process, check out the Build Your Roster! Page (scroll to Invite Your Teammates!). Each player will receive an Invite to officially join your team, verify a uniform size, and pay their assigned portion of the Team Balance via Team Payer. Rosters lock the day after the Week 2 games, and only players that have Accepted your team invitation will get uniforms, so make sure your team is complete by then! Can I create a Company Team? Sure! Several companies offer to pay for all or part of their employee's league fees. Please review the Company Kick-In in our Captain’s Toolbox below, or Email us about any questions regarding the set-up of your company sponsor! When you register for an Underdog League, you choose the location and day of the week you will be playing. Teams usually play 5-7 regular season games plus 1-2 weeks of playoffs at the end of the season, depending on the sport. What do I need to bring to the league? It varies by sport. Underdog provides most equipment, however you can visit our Sports Facts Page to check for your specific sport. Please do wear athletic shoes and clothing! When will I receive my team's schedule? When will I receive the FULL season schedule? The first week schedule is emailed out to captains 5-7 days before the league start date. We only do the first week schedule so that we can take into account team skill level and schedule requests before making the full season schedule, which will be posted 1-2 days after your first game. Is it possible to make schedule requests? What if my team can’t make our game? Yes! 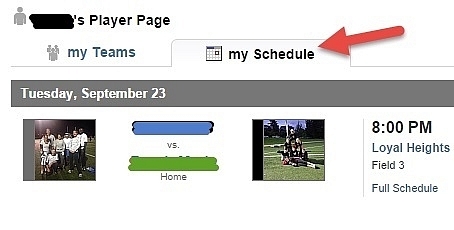 Making a schedule request consists of asking for a change in time, date, or location of your game. Captains can put in schedule requests through your "Manage Team" panel, you can purchase a single date request for $10 or a full season for $20. If we are unable to accommodate the request, there will be no charge. Any requests sent in after the full season schedule has been posted will be considered a game change and will be $30 for each change that we are able to accommodate; however, we cannot guarantee anything once the season has started. You can send schedule requests to schedules@underdogseattle.com. The score was incorrect from our last game! What do I do? As a Captain, part of your responsibility is to double check the scores/standings each week after your game. Please email help@underdogseattle.com with the correct score for your team's game. We appreciate your help! Team Payer is an easy way for your teammates to pay their portion of the Team Balance, so you don’t have to! Send emails to your teammates from your player page with the amount due...see how to do this on the Build Your Roster! Page. When a player Accepts their roster spot, they pay their portion of the Team Balance directly to Underdog, in accordance with Underdog’s Team Payment Policy. No need for players to dig out their checkbooks or pay the ATM free before your game! League costs vary from sport to sport and estimated prices can be found on the Sport Facts Page! Do I need to pay the entire Team Balance when I register? Nope! Captains only pay the deposit at the time of registration, which varies depending on the sport and location. The remaining Team Balance is due the day after your first game. Once your team has a Confirmed spot in the league, the Captain can assign dues via Team Payer to their teammates. As your teammates Accept their roster spot, they will pay their portion and the Team Balance will reduce! Check out the Build Your Roster! Page to see how to assign players Team Payer dues. Will my employer help pay for my Team Balance? Possibly! Check out the Company Kick-In tool in the toolbox below and see if your employer is on our list of participating companies. If your employer is not currently partnered with Underdog, ask your HR Director to pitch in, and we’d be happy to add your company! Team Payer: The easiest and best way to pay for your Underdog team. Be sure to check out the Underdog Team Payment Policy for more specific details. 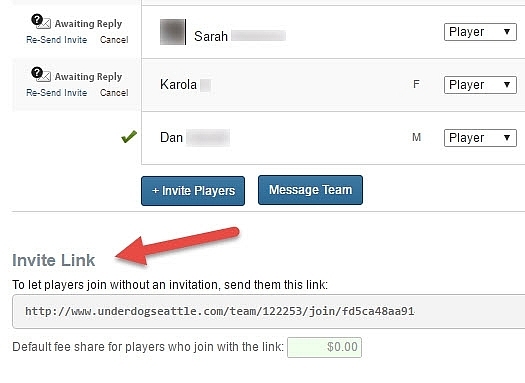 Invite Link: Found in the Captain's Panel on your Player Page, the Invite Link lets you invite players to join your team without sending them an invitation via email or Facebook. Captains can even assign Team Payer dues for players who sign up for their team via the Invite Link! Photo Uploader: Have a sweet team photo that you want to share with Underdog, either as your new Team Picture or just for fun? Fill out our Photo Uploader form and attatch your picture showcase your team's pizzaz. Company Kick-In: A list of employers that participate in the Company Kick-In, a program that allows certain employers to pay for some or all of your Team Balance! 1) From the Underdog Home page, go to “my Player Page” in the top right corner to access your Player Page. 2) From the “my Schedule” tab, find the game(s) you want to RSVP for and indicate whether or not you will be able to attend (thumbs up), be unable to make it (thumbs down), or unsure of your presence (question mark) using the buttons on the right. 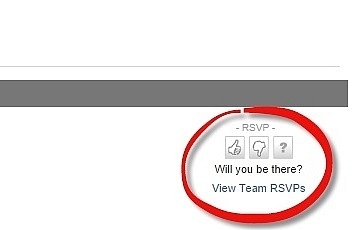 3) To check the RSVP’s from the rest of your team, click the “View Team RSVPs” under the RSVP buttons. Seattle Craigslist Activity Partners Page: Still looking for teammates? Interested in playing another Underdog sport? Check out the Seattle area Craigslist Activity Partners page to identify willing and able participants. 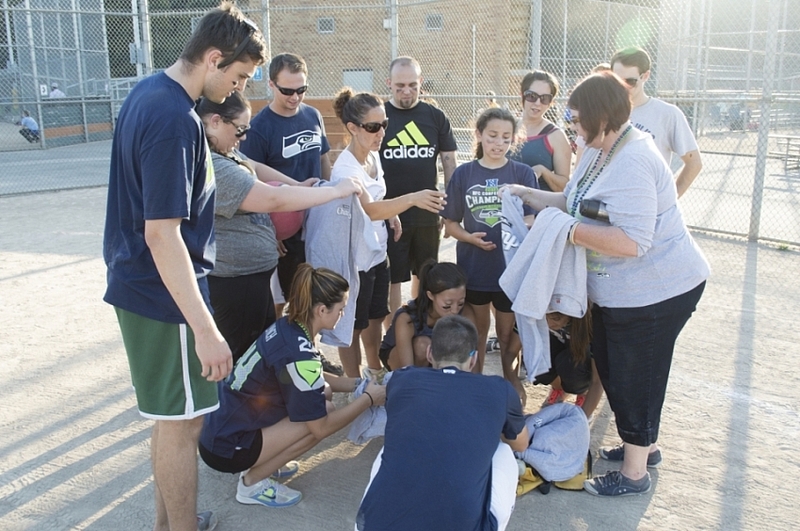 Facebook: Browse Underdog Seattle's Facebook page and connect with fellow Underdog players and teams. Don’t forget to “Like” Underdog Seattle and post using the hashtag #UnderdogSeattle for deals, prizes, and updates! Twitter: Follow @UnderdogSeattle on Twitter to say up to date on all Underdog news and happenings, and to Tweet about your Underdog experience using the hashtag #UnderdogSeattle! 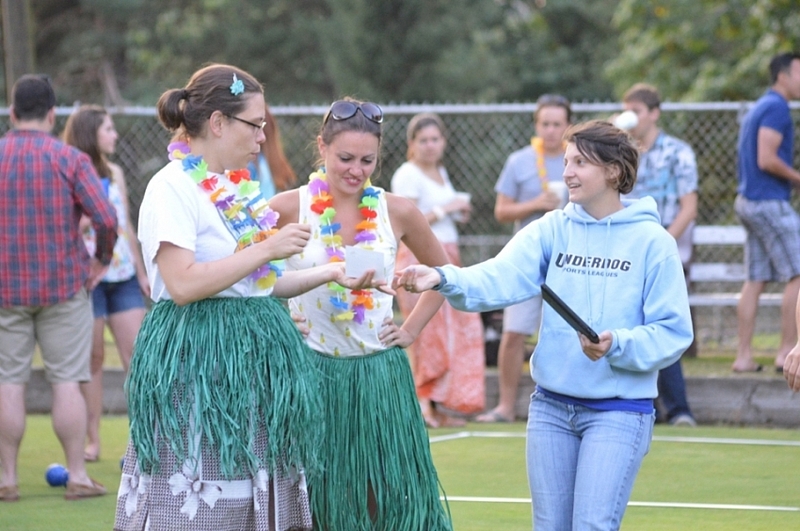 Never heard of Bocce before? Need a refresher on what a flag guard is in Flag Football? 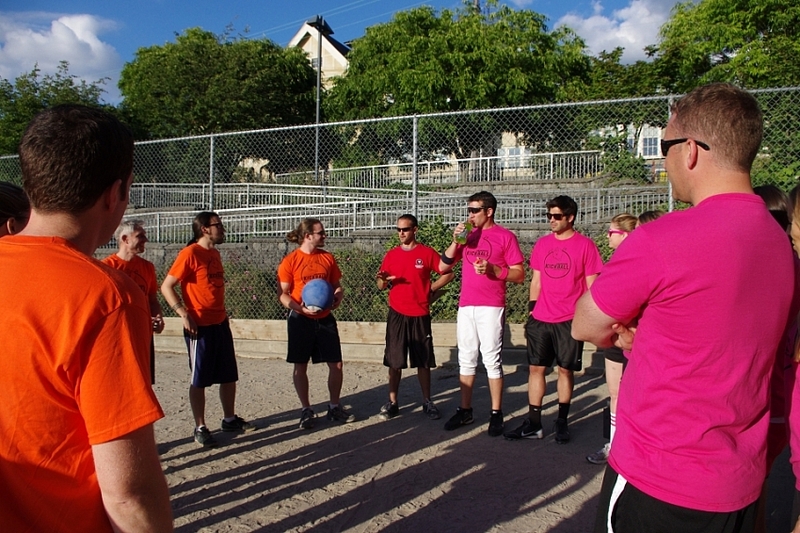 Wondering exactly how kickball is played outside of grade school? You've come to the right place. Confused about new policies? Looking to sign up for another league or sport? Worried about the weather? Do you or your team have a question you didn't find the answer to above? Feel free to consult the Underdog FAQ for helpful informtion concerning Underdog and our policies!